The L'Oreal Professionnel Mythic Haircare Mini Kit combines a luxurious shampoo with a caring hair mask to leave locks feeling healthy and replenished. Housed in a little drawstring pouch. 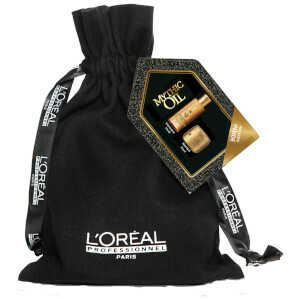 Inspired by the tradition of ancient Egyptian queens’ oil layering for healthy looking hair. The Mythic Oil shampoo is concentrated with Ginger Essential Oil, bringing tonicity and the look of vitality to the fibre. The treatment is also infused with Osmanthus extract, renowned for deeply caring and providing suppleness to hair. The shampoo produces a generous foam, cleansing and revitalising the feel of normal to fine hair for bouncy, healthy and smooth looking hair. Inspired by the tradition of ancient Egyptian queens’ oil layering for healthy looking hair. The Mythic Oil Masque is concentrated with Ginger Essential Oil, bringing tonicity and the look of vitality to the fibre. The treatment is also infused with Osmanthus extract, renowned for deeply caring and providing suppleness to hair. The creamy hair mask makes the hair easy to comb and leaves hair looking nourished. Champú: distribuir una pequeña cantidad de manera uniforme por el cabello mojado. Masajear por el cuero cabelludo durante dos minutos. Aclarar con abundante agua. Mascarilla capilar: aplicar 15-20 g de la mascarilla desde los medios-largos a las puntas con el pelo húmedo y lavado con champú. Dejar actuar durante tres minutos. Aclarar con abundante agua. Para un tratamiento extra, aplicar desde las raíces hasta las puntas y aclarar a la mañana siguiente. Shampoo: Aqua / Water, Sodium Laureth Sulfate, Coco-Betaine, Cocamide Mipa, Sodium Chloride, Amodimethicone, Laureth-5 Carboxylic Acid, Ppg-5-Ceteth-20, Sodium Benzoate, Polyquaternium-10, Peg-60 Hydrogenated Castor Oil, Salicylic Acid, Peg-55 Propylene Glycol Oleate, Propylene Glycol, Hexyl Cinnamal, Benzyl, Salicylate, Benzyl Alcohol, Linalool, Limonene, Citronellol, Geraniol, Osmanthus Fragrans Flower Extract, Zingiber Officinale Root Oil/Ginger Root Oil, Sodium Acetate, Isopropyl Alcohol, Sodium Hydroxide, Citric Acid, Parfum / Fragrance. Hair Mask: Aqua / Water, Cetearyl Alcohol, Behentrimonium Chloride, Hydroxypropyl Starch Phosphate, Glycerin, Candelilla Cera / Candelilla Wax, Propylene Glycol, Cocamidopropyl Betaine, Sclerotium Gum, Isopropyl Alcohol, Phenoxyethanol, Sodium Chloride, Synthetic Fluorphlogopite, Hexyl Cinnamal, Benzyl Salicylate, Benzyl Alcohol, Chlorhexidine Digluconate, Ci 77891 / Titanium Dioxide, Linalool, Limonene, Citronellol, Geraniol, Caramel, Osmanthus Fragrans Flower Extract, Zingiber Officinale Root Oil / Ginger Root Oil, Ci 15510 / Orange 4, Parfum / Fragrance.